The one books all new moms must have. Our resident medical champion is back with a new book and it’s divas all. 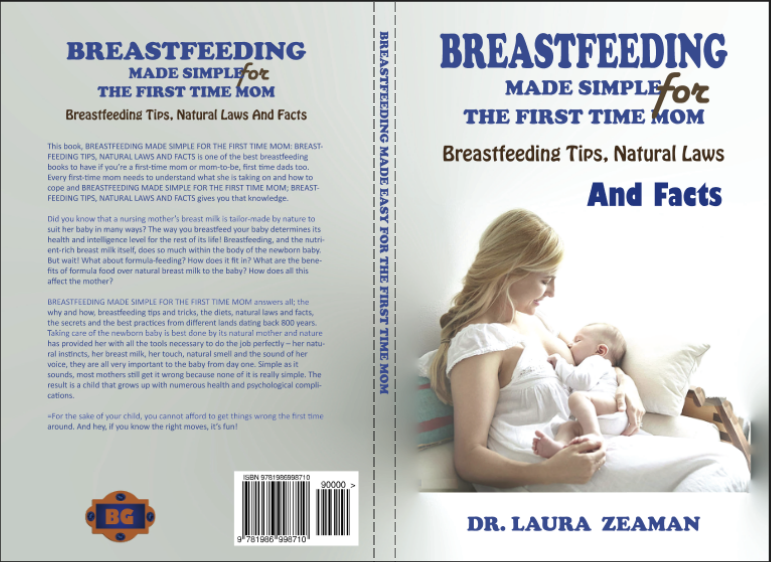 Breastfeeding Made Simple For The First Time Mom: Breastfeeding Tips Natural Laws And Facts is your book!. The author, Dr. Laura Zeaman, is a mother and US-trained medical doctor both. If anyone can be qualified enough to be considered an authority on the subject of Breastfeeding a newborn child Dr. Zeaman definitely is. Although I’m not a lady myself I can’t help but say this book was very enlightening indeed. Never knew the simple process of a new mom breastfeeding her baby isn’t so simple after all. In fact, it’s extremely complex. However, everything was made simple to understand by this book ‘Breastfeeding made simple for the first time mom/breastfeeding tips natural laws‘. The book is a must-read for any new or expectant mom. If you are one, you need to have this book and start learning about that new baby while still pregnant. There’s nothing so wrong as not really knowing or understanding what you are doing with your own baby. Knowledge is power and power can be exploited for the best results. This book gives you that knowledge and power and even teaches how to exploit it for the very best results. The new dads are no exceptions to reading this book either. It is best for all if you get to understand and help in taking care of both mother and child, they are vulnerable during that delicate period of breastfeeding. In her book’s summary, Dr. Zeaman points out that every first-time mom or mom-to-be needs to know and understand exactly what she is taking on and how best to cope. This is what this book, BREASTFEEDING MADE SIMPLE FOR THE FIRST TIME MOM; BREASTFEEDING TIPS NATURAL LAWS AND FACTS gives you. That unique knowledge about your body and your child, both of which will be different from anything you have previously known. She goes on to explain how breastmilk is tailor-made by nature for the child as a multi-purpose substance. Apparently, breastmilk is both food, sleeping pill, tranquilizer and all other kinds of medicine rolled into one just for the child. Always wondered why a naturally breastfed child hardly ever gets sick! BREASTFEEDING MADE SIMPLE FOR THE FIRST TIME MOM; BREASTFEEDING TIPS NATURAL LAWS AND FACTS give answers to all the questions a new mom might have about breastfeeding her baby. the how, the why, the best breastfeeding tips and tricks to employ, the natural diets, laws and facts, the best practices from different lands and time dating as far back as 800 years. Are you a new mom? Know this. The way you breastfeed your child in those first months of its life tell how smart it will grow to become, how healthy and illness free. Get this book and learn to do it all correctly. In truth, nothing is as easy as you think. Below is the knowledge this book offers a breastfeeding mom to help. The best way to care for her baby from the very first day it is born. An understanding of all biological changes that occur in the body of mother and child. How to care for a sick child. Getting all the important things correct with your baby the first time around. Moms, for the sake of your newborn child, you cannot afford to go wrong anywhere the first time around. Dr. Zeaman points out that the right moves are fun if you know how! This book is available on every major bookstore online. Both paperbacks and digital form of this book are available on Amazon. Hitting the Amazon links above will redirect you to buy the book on the Amazon sales platform for your location, e.g, Amazon UK, Amazon USA, Amazon France. In the event of a redirection error, you will have to find the version of the book you want with its unique ASIN numbers; both the numbers of the paperback version and digital ebook version are specified above. To learn how to do this, read this article How to find products on Amazon. Below is the Books2Read universal link for this book. You can follow the link to find it on iBooks, Nook, Kobo, Barnes & Noble, etc. This book, Breastfeeding Made Simple For The First Time Mom: Breastfeeding Tips Natural Laws And Facts is one I strongly recommend for every new mom. Got a problem getting this book anywhere? Contact Us. A book for the first time moms.